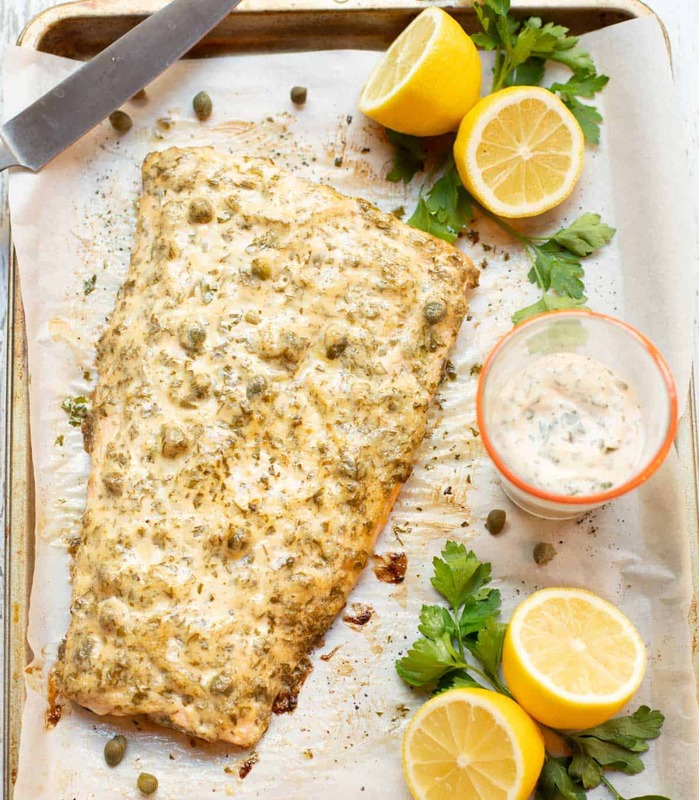 For those days when your schedule is overloaded, Busy Night Baked Lemon-Caper Salmon can be on the table in less than 30 minutes from when you open the refrigerator! We all have those days (weeks!) where the thought of making dinner is overwhelming – those days that are so busy, you barely have time to think. Mom always said it was important to have “busy day” recipes in your repertoire. 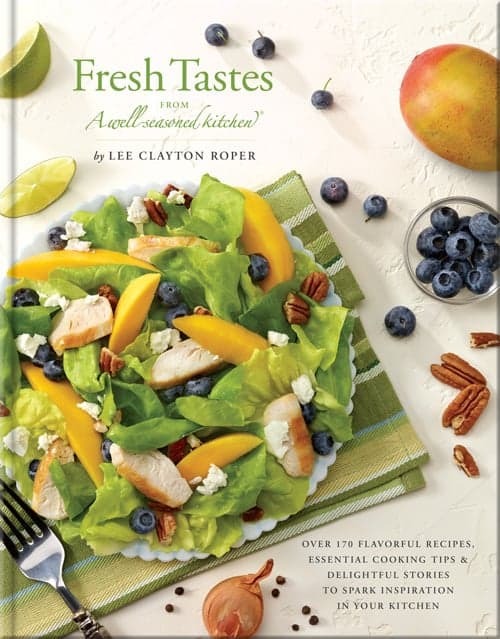 One of those recipes is her “Busy Night Baked Chicken with Spinach” that’s in our cookbook, A Well-Seasoned Kitchen®. 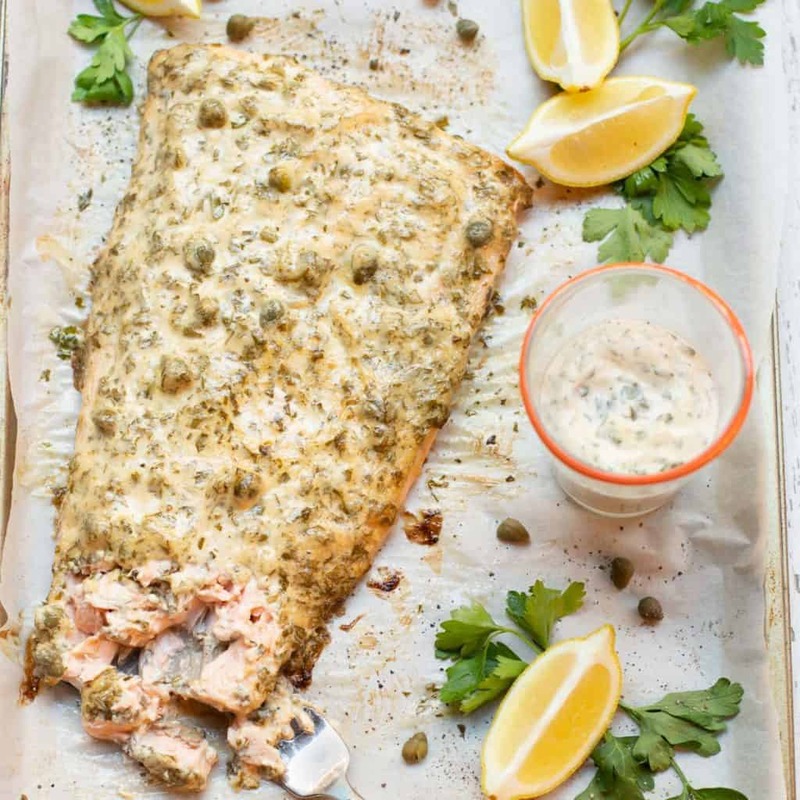 This recipe for Busy Night Baked Lemon-Caper Salmon is another one of those busy day, go-to recipes. With a total of 7 readily-available ingredients, you can easily get a delicious dinner on the table in around 20 minutes. Simply stir together mayonnaise, chopped parsley, lemon juice, capers, Worcestershire sauce and white pepper; then spoon atop a salmon fillet (or salmon steaks) and bake. That’s it! While the salmon is roasting, I steam broccoli or asparagus, cook up a packet of Seeds of Change Quinoa & Brown Rice (90 seconds in the microwave! ), and in less than 30 minutes dinner is on the table. You’ll find yourself wanting to make this salmon often, not just because it’s quick and easy, but because it’s moist, flavorful and super scrumptious! For those days when your schedule is overloaded, this moist, flavorful salmon can be on the table in less than 30 minutes from when you open the refrigerator! Preheat oven to 350 degrees. Line a rimmed sheet pan (or cookie sheet) with parchment paper. In a small bowl, stir together mayonnaise, parsley, lemon juice, capers, Worcestershire sauce and pepper. Place salmon fillet, skin side down, on prepared sheet pan. Spread mayonnaise mixture evenly over the top. Bake, uncovered, 10 to 12 minutes, or until desired doneness. Let stand for 5 minutes before serving. Note that the salmon will continue cooking for a few minutes after you take it out of the oven. Serve immediately, with lemon wedges on the side. 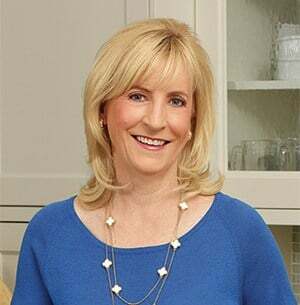 Gluten Free: Use gluten-free Worcestershire sauce.